Most people can tell you a few good stories about great rock shows they remember though the haze of drugs and booze. I’ve seen it happen within a group where everyone tries to up the anti with a wild tale from their past rock ’n’ roll experiences. I can play that game as good as anyone with a list that ranges from Jimi Hendrix Experience to The Who, Cream to Led Zeppelin, The Temptations to The Four Tops, The Young Rascals to Vanilla Fudge, Little Stevie Wonder to Cannibal & the Headhunters, Steely Dan to The Moody Blues, Wilson Pickett to Sam & Dave, Devo to James Brown, or The Shirelles to Patti Labelle & the Bluebells… but I ain’t Carter Alan. He’s put the time into sharing his otherworldly stories. 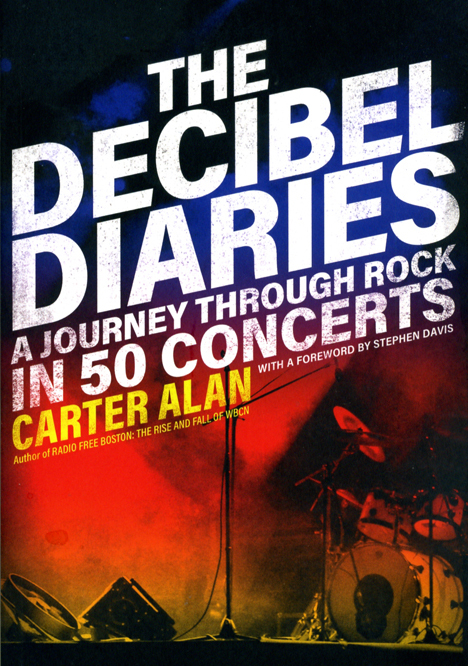 Carter relives his impressive list in The Decibel Diaries. He’s had the benefit of working at the most influential rock station Boston has ever had – The Rock of Boston… WBCN. That affiliation put him in some pretty amazing situations with bands that have top the charts. He’s been stage front, backstage, and on stage announcing some of these meglo maniac stars. And the picture Carter paints isn’t always pretty. In fact that’s what I love about Carter’s writing. He doesn’t sugar coat anything. He lets you know the worst of situations that are sometimes overcome, sometimes not. In The Decibel Diaries you can follow the ups and downs of Joe Walsh’s career from the early days of the James Gang to flying with the Eagles only to later crash land. How ’bout getting invited to Joe Perry’s 50th birthday party – what was that present that Slash gave him? And of course you know you’ll get more inside information about U2 – Carter had to be an unofficial member. How else could he have written BOOKS on them? His story about Bruce Springsteen’s glance is evidence of the power of silent rock ’n’ roll at its loudest. More wigged out stuff about Talking Heads, Ted Nugent, the Rolling Stones, Eric Clapton, Neil Young, The Clash, Roger Waters, AC/DC, Nirvana, Paul McCartney and Jack White – and that’s only the tip of Carter’s rock ’n’ roll mountain peak. Wanna feel the pressure of a big time rock concert? Care to hang out with Carter Alan? Smell his sweat as you are squashed into the front of a stage with him? Wanna mind meld with his knowledge of rock through the ’80s and ’90s? Not only does Carter bring you along, he digs into the history of sales and charts to clarify the situations at hand, despite the amount of drugs and alcohol that ran through these mortal men who conducted performances that rose them to the level of modern day gods. Their success or lack of it was a living and breathing beast. The smell of that behemoth permeates this book. Get the stench on you… absorb their lives. I think you’re gonna like this new drug… this book does the trick. Are your ears ringing yet? And when you’re through reading The Decibel Diaries make sure to catch up on Carter Alan’s other printed releases… Radio Free Boston: The Rise & Fall of WBCN, U2: The Road to Pop, Outside is America: U2 in the U.S. and U2 Wide Awake in America.